Make your fruit leather on a clear, hot day. It won't work if it's cloudy or too cool (less than 85 degrees). 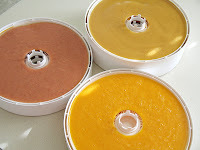 Puree any combination of fruit in your blender. Place parchment paper into a cookie sheet (cookie sheet must have edges). Spray parchment paper with Pam or wipe with vegetable oil. Pour pureed fruit onto parchment paper until it is about 1/8 to 1/4 inch thick. If it is too thin it will break apart too easily. If it is too thick, it won't dry. Park your car out in the sun. Leave your cookie sheets in the car. It might take two days for the fruit to fully dry. Finish drying in a low-temp oven if it hasn't dried after two days. Puree any variety of fruit in your blender. 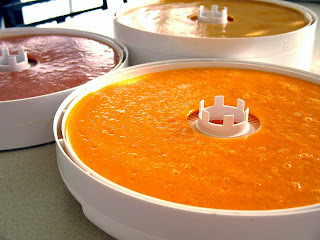 Spray or wipe fruit roll-up trays with Pam or vegetable oil. Pour fruit into trays until full. Turn on dehydrator to recommended temperature. It takes about 24 hours until they are dry. Don't bother to roll and wrap with plastic wrap if your house is like mine. I made my first batch two days ago and it's already gone. These trays have (clockwise from the top) peaches mixed with applesauce, only peaches, and strawberries mixed with applesauce. I add 1 T. of lemon juice per blender-full of puree to help slow browning. Applesauce is a great extender. I buy it in #10 cans at Costco for about $4. I dried this batch too long and it crackled apart. It still tastes good, but is harder to roll onto plastic wrap.